WingerBLOG: 20140317 - Dad! We Caught One! 20140317 - Up in the am to G yelling: "Dad! Dad! We caught one! ", we did? 'Yeah but he got away. He must have gotten his pocket caught in the trap because here is a piece of it and he dropped 4 gold coins. Look!" Super cool! Well another year and the leprechaun got away. At least this year there was a profit... In to work and had a normal Monday. Home and thankfully baseball was cancelled, so not so busy of a evening. L dropped D off at Scouts and I helped J with a report on the rain forest and taught him some photo editing tricks. 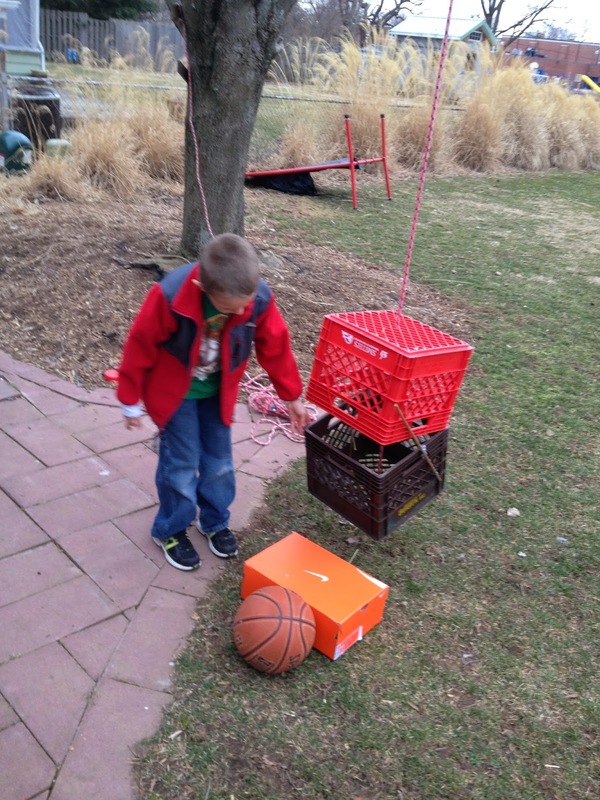 Before I had to go get D G wanted me to help him rest the leprechaun trap. I told him I don't think they would come back a second night, and if the same one came back he may be extra cautions and not fall for the same trap again. We added some modifications to make the trap more fool proof and it is all set! Off to Scouts to get D and check on advancements. Home and took a quick look at D's math, stuff I haven't seen for 20 years or would ever attempt without a PC now... Left L to deal with that, sorry L. I got Doc and took him to McD's. Today marks the 1 year anniversary of Priscilla passing. A sad day for Doc. We had a good meeting at Bible bangers and Doc is doing well.